Benefit from our established industry links and get your career off to a flying start. "I'm currently working on the Birmingham Mail's football desk, as an advanced content writer. As a Birmingham City fan, this was a dream job for me - and I secured the position before I'd even completed my degree! Starting out in my career whilst still studying was a challenge but the course prepared me so well, I was able to take it all in my stride. The degree has given me the perfect skill set to move forward, and it is testament to the excellent lecturers that my employers were confident enough in my abilities to offer me a job before finishing my education. The connections that the university provided were vital in opening doors to industry and I couldn't have got anywhere near this far without such fantastic support." Amazing experience that will raise your game. "What an experience! Wouldn't be possible without @BASports.Journo!" Sean Watts, course graduate and West Bromwich Albion press officer. Our students benefit from our links with professional clubs, such as Gloucester Rugby. 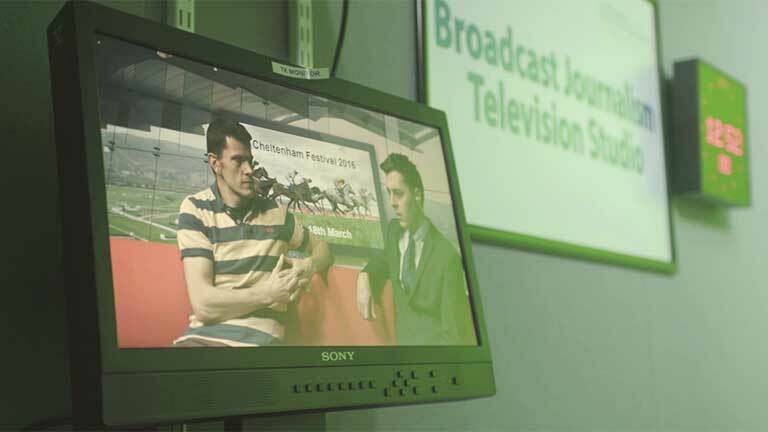 Patrick Banes did a placement as a radio reporter, covering the world famous Cheltenham Festival. Learn your skills in our cutting-edge facilities, with all the very latest broadcast equipment. Our media centre is equipped with TV and radio studios, multimedia newsrooms and an apple mac suite. Everything is as you will find in the industry â?? from the Burli newsroom management software we use, through to our BBC-standard JVC cameras. We also have all the latest broadcast technology, such as iPhone mojo kit. "I pride myself on being current. Alongside lecturing, I'm still going out and doing the job I love, writing for national newspapers and websites about the latest sports news. I make sure my students benefit from my connections, be that by setting up interviews for them with high profile athletes, or organizing work experience placements with major national titles. There's no better buzz than reporting on live sport. To be there covering events watched by the rest of the world on TV is an unbelievable experience money can't buy." Meet Adam, and see how his course in Sports Journalism gave him the skills he needed for his dream job. Taught by award-winning sports journalists, this course will give you the skills and knowledge needed to thrive in the industry. You will benefit from our strong links with national and local media, including the BBC, ITV, TalkSPORT, The Times, The Sun and The Racing Post. Broadcasters Sharron Davies and Jill Douglas are among the many guest speakers who have given our students a valuable insider’s view of the industry. You'll immediately start work on multimedia news bulletins and prepare reports for radio, television and online. Thanks to our excellent links with professional sports clubs such as Gloucester Rugby, a range of Premier League sides, Cheltenham Town Football Club and Gloucestershire Cricket Club, there are plenty of opportunities to put your practical skills to the test. 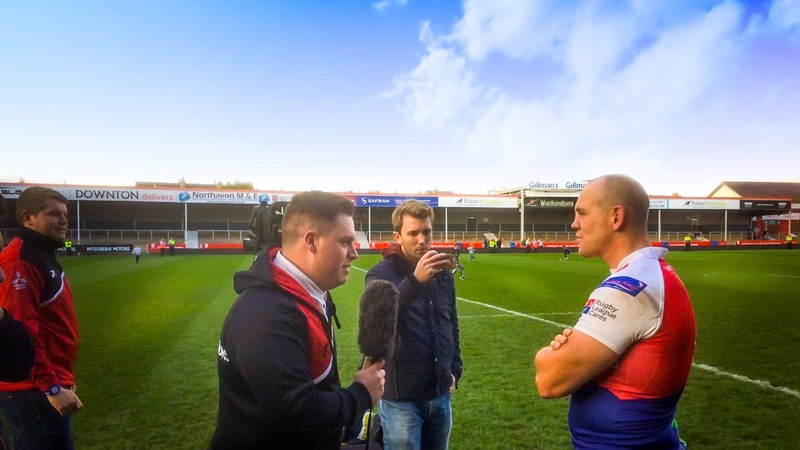 Students have joined professional journalists to interview international footballers, made films for the big screen at the Rugby World Cup Fanzone in Gloucester Quays, and produced content for BT Sport’s Conference football highlights show. From your first term here you'll have opportunities to get involved in live match coverage. This will give you access to professional players and allow you to build your own contacts. You’ll also complete a work placement as part of your degree, gaining further industry insight and experience. Get Sports Journalism course updates and hear more about studying with us. Learn how to be a multimedia journalist, gathering and delivering stories for online and print. You’ll also produce radio and television bulletins. Social media and emerging digital technologies are embedded across all modules, so you can learn the latest industry-relevant skills such as live text commentary and mobile journalism. In your final year you can choose between an academic dissertation or extended practical project. The course has close ties with industry, including the BBC, BT Sport, talkSPORT, ITV and The Daily Express. You'll also get insight from high profile sports journalists. Guest speakers have included Tony Evans, former football editor at The Times, and BBC reporters Pat Murphy and Tom Rostance. Excellent relationships with professional sports clubs, including Premier League football clubs in the Midlands, provide opportunities to gain practical work experience and build your professional network from the start of your studies. This course is also accredited by the Broadcast Journalism Training Council (BJTC), giving our graduates a real competitive edge. Fill in the form below and we'll be in touch with Sports Journalism updates, upcoming events and everything you need to know about university life.